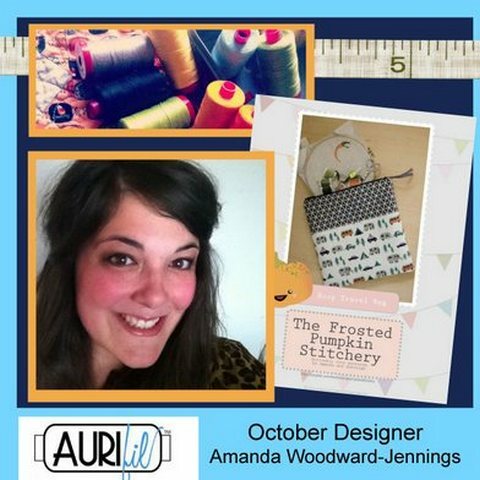 October Designer of the Month Amanda Woodward-Jennings! I know you are going to love Amanda’s interview and her block is incredibly adorable… but that means you need to work on catching up so you can see all the blocks together! Let’s get to know Amanda! I taught myself how to embroider in college, I thought it was a super fun way to embellish things and a budget friendly craft. 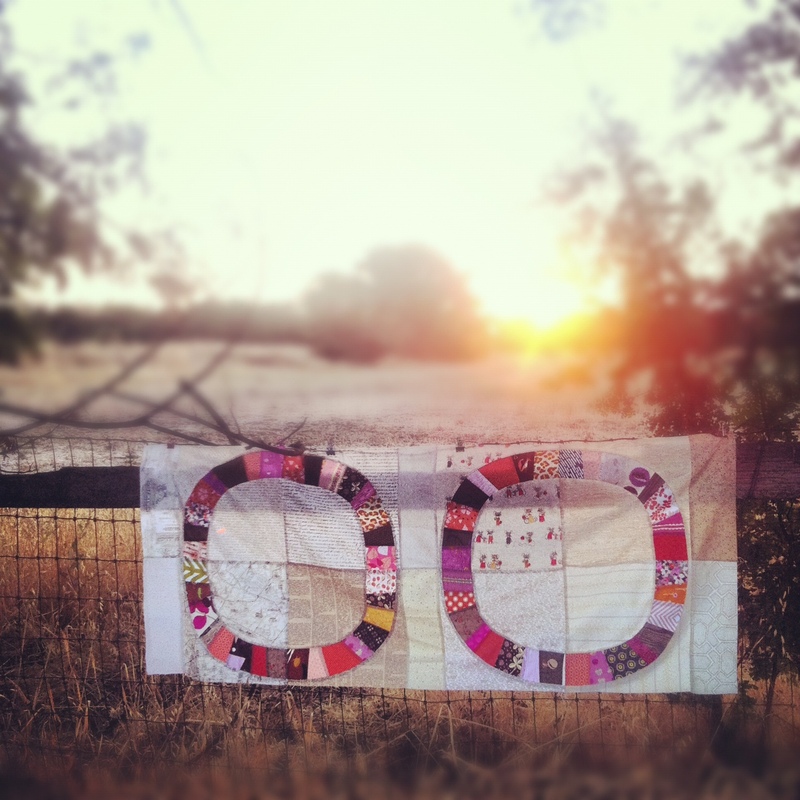 I learned how to quilt from the amazing ladies at Scottie Dog Quilts/Redwood Sewing Center in Eureka, CA! Back stitch! For sure! I love making all the little bumps and it’s not terribly hard! 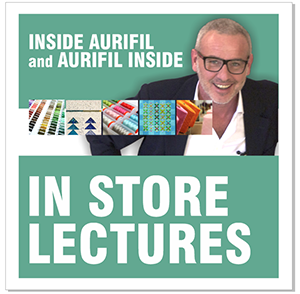 Did you work at another career prior to your design business? 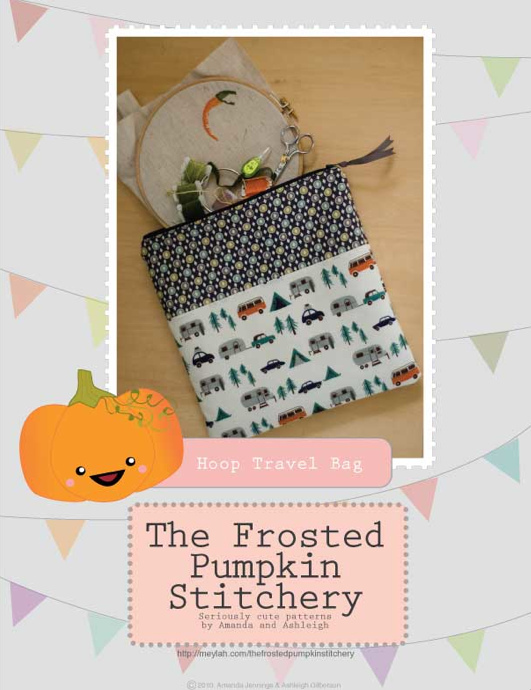 I left college to work on my sewing business full time, now I work with my very best friend Ashleigh on The Frosted Pumpkin Stitchery! 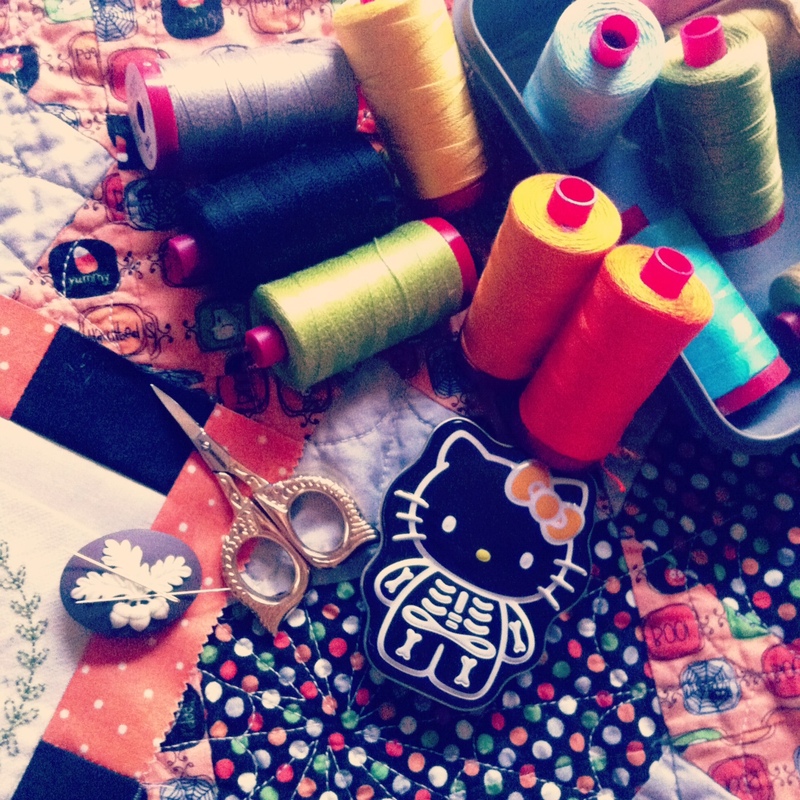 It’s our kawaii cross stitch pattern company and our most favorite thing on earth! 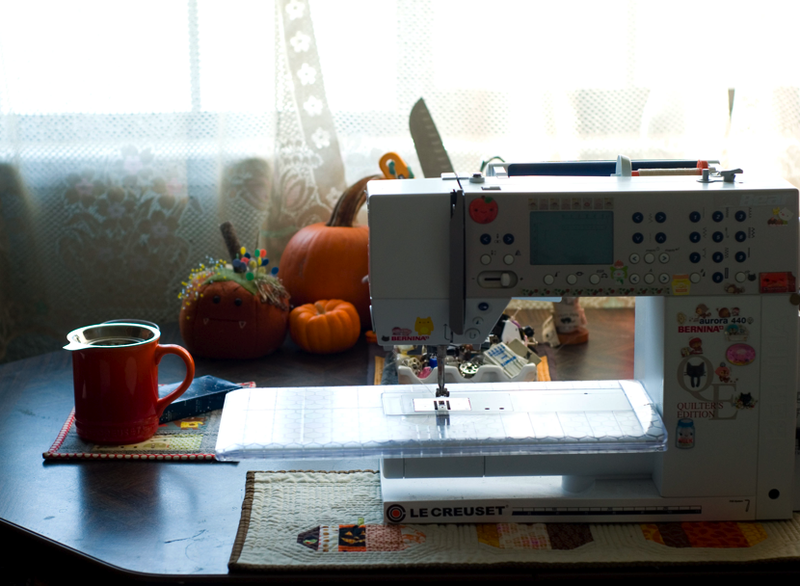 I sew at our kitchen table. I used to sew in our dining room but I love being able to sit in front of windows and keep an eye on whatever I have going on the stove or oven. I cook pretty much nonstop so this way I can sew AND cook! I recently lost an entire bag of half finished cross stitches, patterns and thread so now I’m REALLY diligent about keeping all my supplies in one spot. 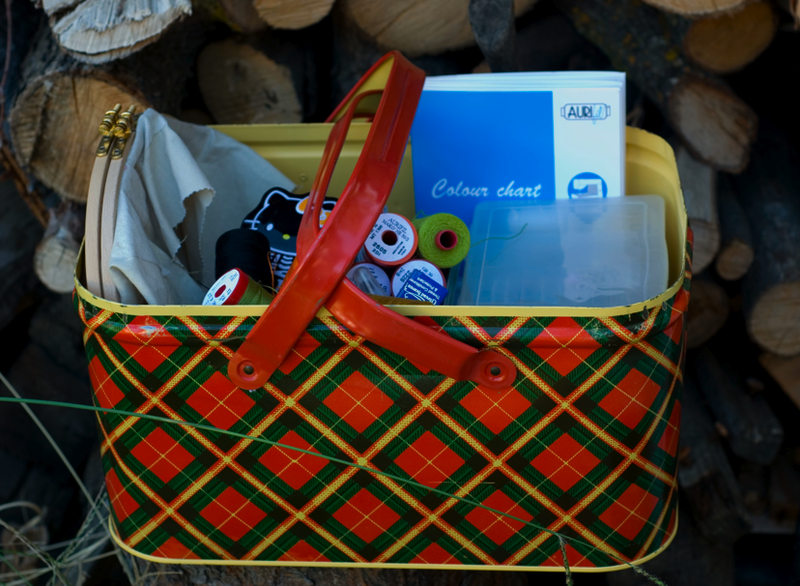 Chop, my husband, surprised me with a vintage picnic basket, I keep my color cards, floss, projects, patterns and hoops in there. Plus! It’s portable! So I can take it in the car and outside, I love having everything in one cute spot! 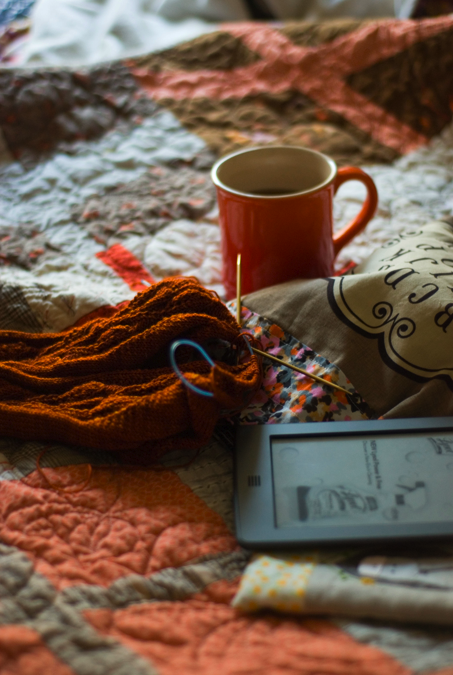 I love catching up on Masterpiece Mystery with Chop, hanging out under a quilt, knitting, reading and just being COZY. Or when I’m teaching people how to cook and can, it feels pretty amazing to watch things “click” on peoples faces! I generally make little wonky sketches and email them to Ashleigh, my bff and Frosted Pumpkin Partner in Crime. She’s incredibly computer savvy and just amazing. 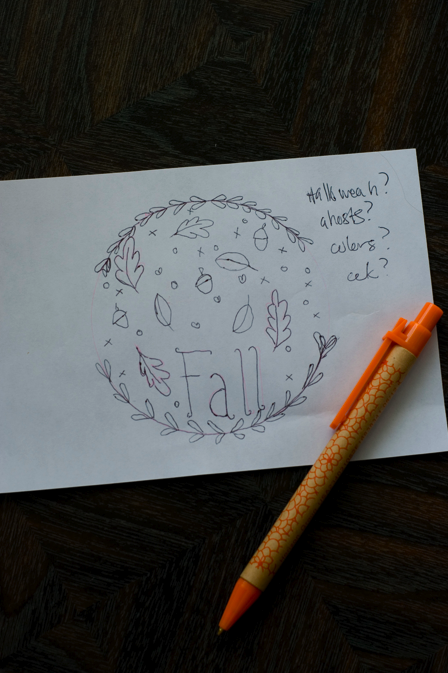 I am the WORST at technology, she turns my sketches and ideas into pdfs, patterns, etc. I LOVE TO DRAW. I went to college for art and would fill up dozens of sketch books. I think that might be why I love quilting, it’s like drawing but with thread. I have a secret. I piece special quilts with special colors. Last winter I pieced a neutral quilt with 4020 (the perfect hot pink), I’m currently piecing a Single Girl quilt with 4660 (variegated pinks!). I believe that quilting should be fun & I won’t waste my time piecing with white. If I absolutely HAVE to use a neutral, my favorite is 2310, I pieced the majority of my Farmer’s Wife quilt with it. My other two VERY favorites are 2605 (amazing gray!) and 3840 (variegated purple). I’ve never ever ever had Aurifil thread show through to the front of the quilt so why not play with color? There is something super satisfying knowing that your favorite color (or who ever gets the quilt!) is hidden in your quilt. I have two that I *love*! My amazing friend Lindsay (http://www.eileenquilts.com/) sent me this acorn needle minder (http://shop.theworkroom.ca/product/kelmscott-designs-brown-acorns-needle-minder) that I absolutely ADORE! Hands down without a doubt Heather Ross. She is my hero, her fabrics are so dreamy and perfect. I love that she draws inspiration from her childhood and the memories they invoke are just so amazing. 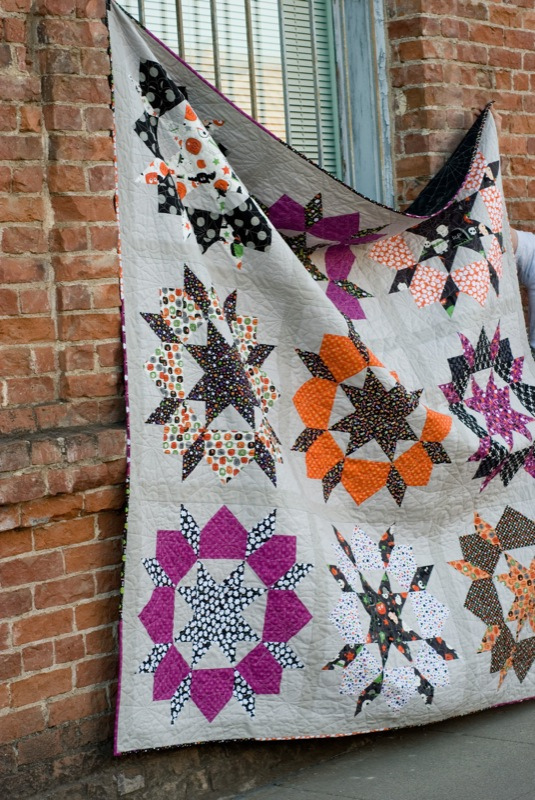 I think I’ve used her West Hill Peach Ponies in every single quilt I’ve ever made. Her fabric just clicks with me and makes me want to sew sew sew sew sew! ‘Why did you select the image you did for your block’? 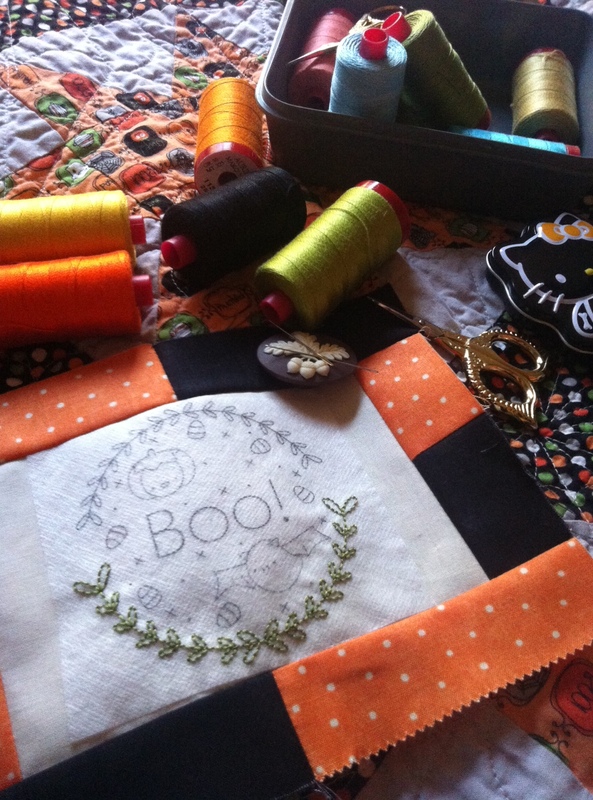 I originally planned a fall embroidery but as I went through the layer cake I saw the black and the orange polka dots and knew I *had* to do something REALLY halloweenie! I absolutely adore Halloween, my wedding anniversary is the day before and I just loooooove it! I knew I wanted to draw some laurel branches and add in some x’s and french knots for texture. Then Ashleigh & I started brainstorming with bats, ghosts, pumpkins, etc. We ended up with this design! 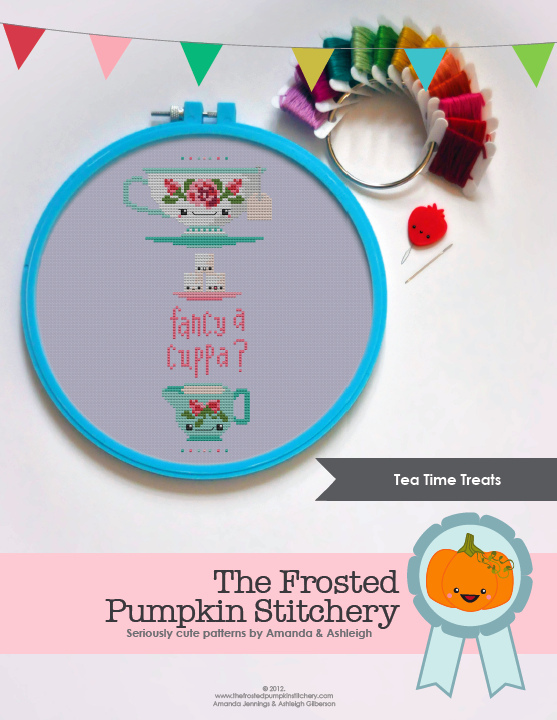 It’s really fun and I think it would be super cute on a trick or treat bag or tea towel! If they made a movie of your life, what actress will play ‘you’? good question! I think someone quirky like Drew Barrymore! Your Favorite Movie -Can I cheat and tell you three?! Lost in Translation, The Royal Tenenbaums and Step Brothers!!!! Dream Vacation spot -The more rural the better! I’ve love to rent a cabin in Montana or Wyoming and hunt/knit/read/fish/cook/relax! The Color you have always LOVED…..Gray!!!! 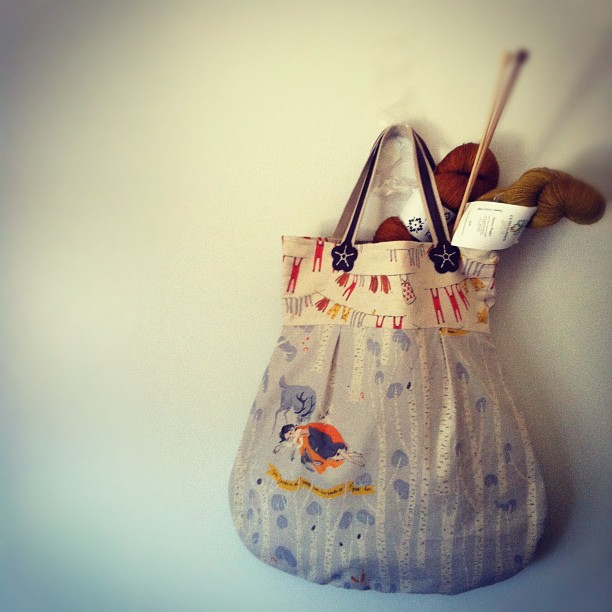 CLICK HERE to order her stitchery tote pattern… so cute! 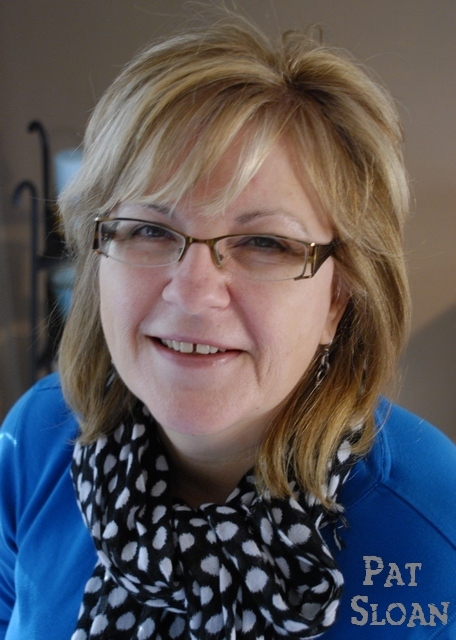 ← September Designer of the month, Amy Ellis! The adobe will not open up the file to print. 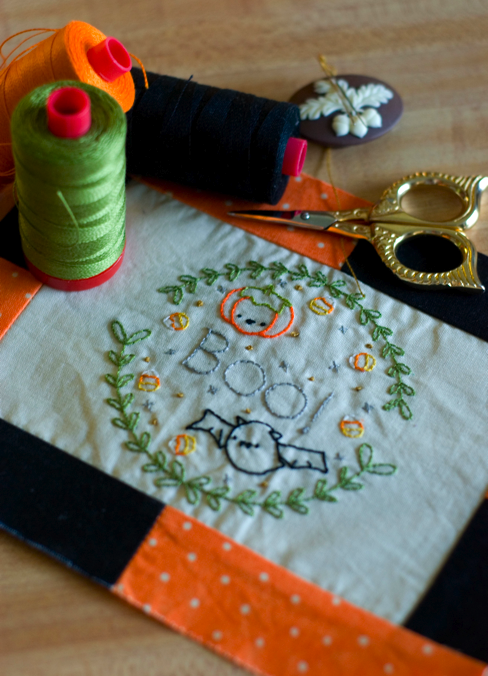 I/ve tried many times I love the pattern it is great the boo pattern for October. Thanks a friend sent it to me and I printed it out okay. Thank you for the “Boo” pattern. I enjoy your blog that there are so many information to know. All your patterns are adore and amazing. Thank you for another wonderful design to have fun stitching. I like your style! Thanks for the fun pattern! Fallen in love with Aurifil threads and so appreciative of the fun stitching pattern. Is there one site where all these blocks can be seen and downloaded? This is the greatest block so far. I love it. 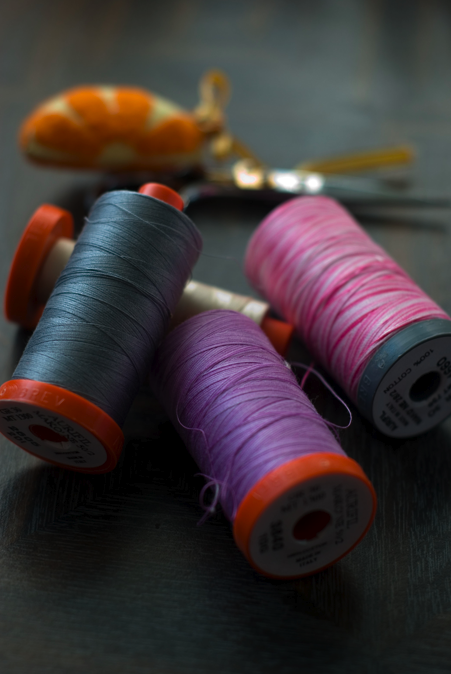 Sewing machines may be a fast method of sewing things, but hand sewing with a needle and thread is sometimes more convenient. 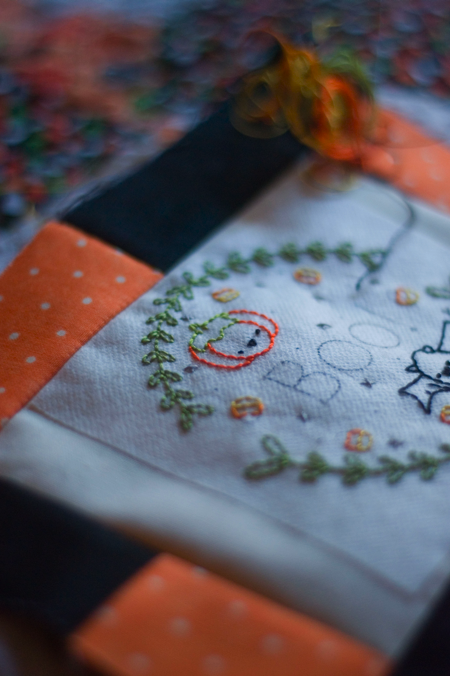 Beginners usually learn to use a needle by practicing the running stitch because it’s basic and straightforward. 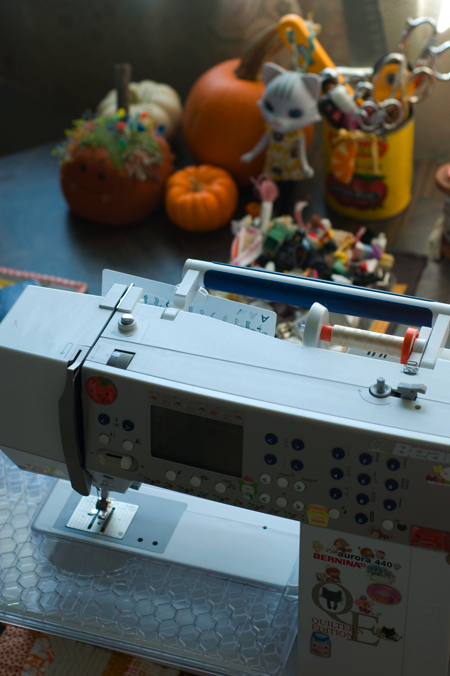 Once you have mastered the use of a needle, you can learn complicated stitches and even advance to complex needlecrafts such as quilting and embroidery. I have placed orders at Bunny Hill Designs and Primitive Gatherings Quilt Shop . I recently made a trip to Buggy Barn Quilts. I may not eat this winter but I won’t run out of projects. LOL! I am so excited to get new projects to start. Not that I didn’t have plenty to start working on already. 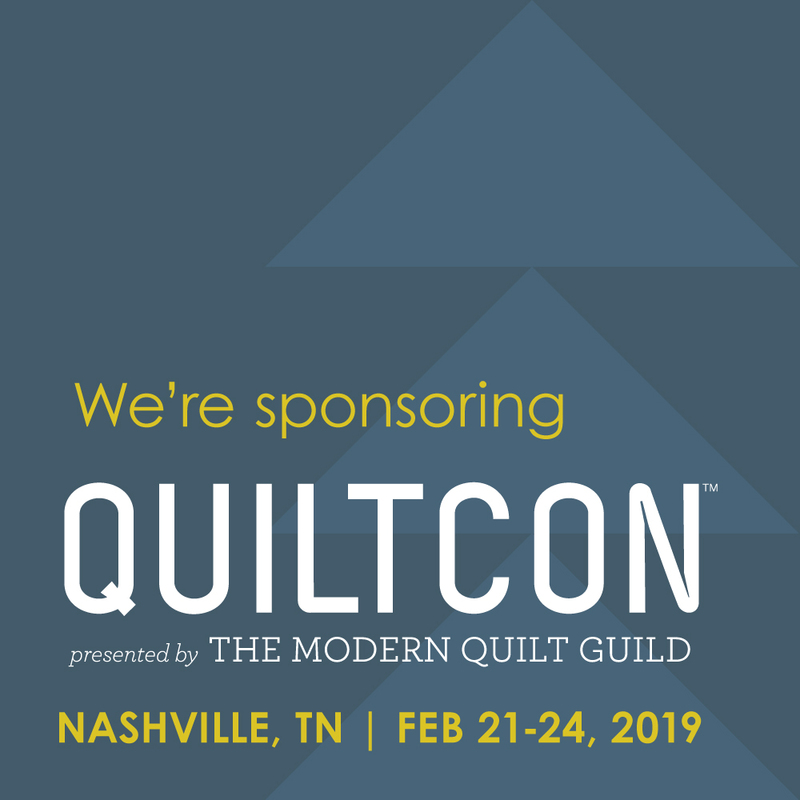 You know how it goes though if you are a quilter or fabricaholic! Just can’t get enough of it packed in the sewing room, under beds, closets, etc. I can’t wait for the UPS man next week. I will be in a state of exhilaration until I get my paws on those packages. I know you have been there, right? 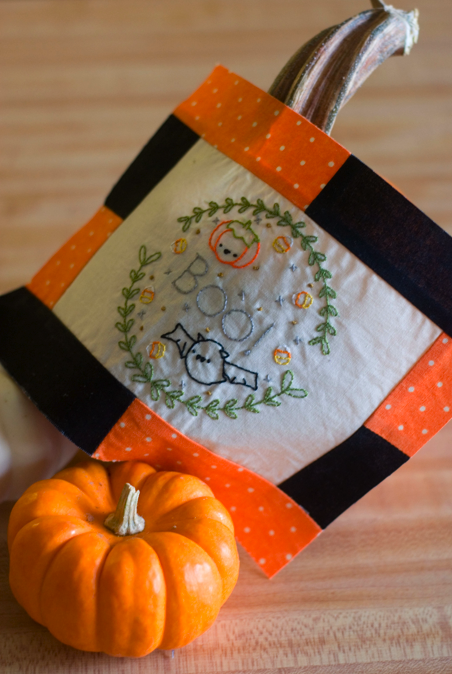 I am almost finished with the wallhanging I got from Pumpkin Patch Primitives last week. Maybe I am on a roll here. 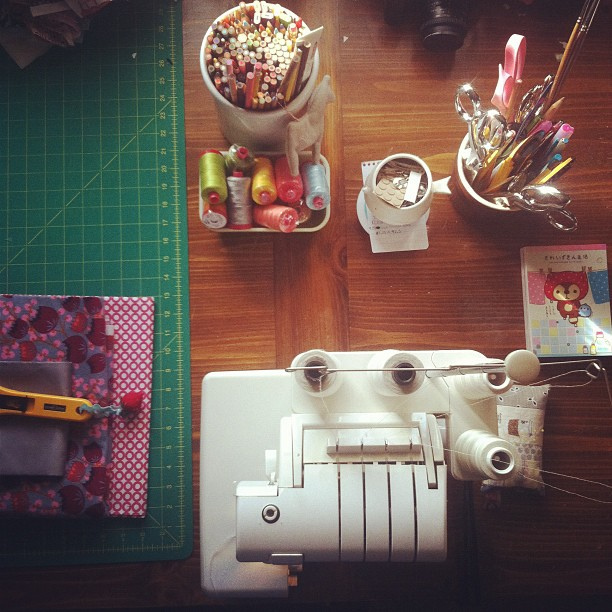 I haven’t been doing much sewing or stitching for quite some time. Now I am ready to get after it! I’m an artist.I love to sew,knit,crochet and paint. I spend a lot of time creating and learning about creative activities and creative people.